A few years ago, I was on a mission to find (and eat) a persimmon in the wild. I had never seen one before — or not that I had noticed. 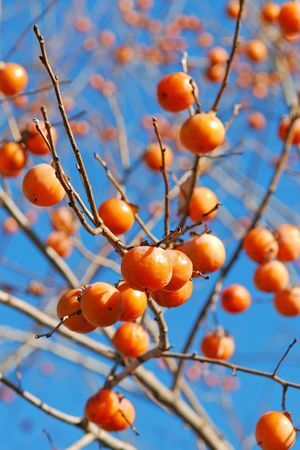 It had lost nearly all its leaves but had small roundish orange fruits hanging from its branches. That’s what made it stand out this time of year (and not sooner). The first fruit I tried was not quite yet ripe. One bite of it and I almost gave up on persimmons forever! Very bitter! However, after the bitter taste wore off in my mouth, I gave it another try with another softer, riper fruit. This one tasted like pure heaven! Almost like a creamy, butterscotch custard. And the color was beautiful — it looked like a tiny pumpkin, but had skin more like a tomato, yet stronger. I recently learned from another blogger that in Buddhism, persimmons are symbols of transformation. Six persimmon fruits are symbols of enlightenment. The symbolism reveals that green persimmons are acrid and bitter in their immature state, they represent ignorance. As the fruit matures, it becomes sweet and represents wisdom that comes after transformation. I had a photo shoot last week with my dear friend and fellow timebanker, Jennifer Shelhart, last week. I even got my hair and make up professionally done for this one! On my way from the the salon to Jennifer’s house, I saw a fully loaded persimmon tree and had to stop to pick a few. I included several as props in some of the shots we took, can’t wait until they’re done to share them. I turned 50 last year. I’d like to think I’m past my immature state now and that as I have matured, I have become sweet and wise. I’m working on the enlightenment part…here’s hoping. What I have realized is that I really, really love wild edibles and want to share my knowledge with others. This is part of my most recent transformation. I’m not ready to do a big launch yet, but why not seize the day and get the fruit while it’s ripe? If you’d like to join me Friday, Oct. 27th at 4pm in Valparaiso, you’ll get to meet my favorite persimmon tree. You’ll also be introduced to Staghorn sumac and spicebush too. If you’re good I’ll even show you where to forage for some apples. This will be a very short (approximately 1 hour) outing, so cost will only be $15/person. Longer hikes will be priced accordingly. Meet up location will be in Valparaiso, exact spot will be emailed just prior to the event. Cash only, please bring exact amount. If you would like a copy of my ebook “Born to Eat Wild” and 1-2 recipes for each item emailed to you, I’m happy to do so for an additional $5.